Some readers have been asking how one can reconcile positive signs in the housing market with declining rates of homeownership. 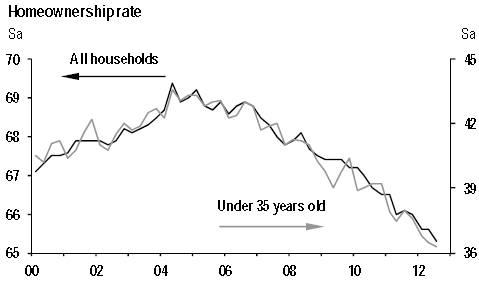 Indeed, homeownership is falling at an even faster pace than during the 08-10 period (chart below). The explanation is that so far a great deal of net demand growth in housing has been in rental units. Households are putting a premium on mobility. This demand for rentals is in fact one of the factors supporting the housing market - for every renter there is a landlord who buys a home. JPMorgan: - There is no contradiction between increased demand for housing and reduced homeownership rates. Demand for housing is mainly dependent on the increase in the number of households, whether these households choose to own or to rent the housing units they live in. Growth of household formation had been stifled during the expansion to date by high unemployment and subdued job growth. Young people have had an especially tough time in the labor market, and many who could not find jobs or could not find good jobs are living with their parents or are doubling or tripling up in apartments with friends. In addition, tough labor market conditions have discouraged immigration. But labor markets are gradually improving, and the period of maximum weakness in household formation is behind us. And the increase in the number of households has accelerated over the past year, to growth of 1.01% or 1.15 million, the largest annual increase since 2Q06 if still somewhat below the norms prior to the recession. The decline in homeownership rates implies that virtually all the increase in demand for housing units associated with increased household formation consists of increased demand for rental units. Indeed current estimates indicate that over the past year the number of occupied rental units increased 1.32 million and the number of owneroccupied housing units actually declined 175,000 (although the number of reported owner-occupied units was up in the latest quarter). With household formation on the rise (see discussion) and mortgage to rent ratio at 0.63 (record low), the homeownership rate should stabilize in the near future. It is unlikely however that the rate will ever return to levels we saw in the early part of the last decade. The "American dream" propaganda associated with homeownership is no longer part of the culture - the concept that every household should own a home is simply flawed. Labor mobility has become an important dynamic of the US economy, both in terms of skills and geography. This adjustment is vital in order to address the rapidly changing labor demand (see discussion). And high levels of homeownership tend to hinder labor mobility, particularly when house price appreciation rates stay subdued.